As the Financing partner for European businesses at each step of their development, Euronext has launched a series of initiatives designed to facilitate market access for mid-caps. The Free Market and Easynext became Euronext ACCESS®, and stands as the gateway for companies seeking simple access to listing. Alternext became Euronext GROWTH®, a market dedicated to mid-caps with listing requirements adapted to their specific needs. Euronext (compartments A, B and C) remain the group’s regulated market, and operate with no changes. Within the Euronext ACCESS compartment; a new compartment called Euronext ACCESS + was created. Designed for both start-ups and SMEs, Euronext ACCESS + helps them make a smooth transition to the market and adapt to its operations. This new compartment is a springboard to other Euronext markets. Companies admitted to trading on Euronext ACCESS + will be given additional assistance and their shares will benefit from greater visibility. and commitment to regularly communicate towards the market. Euronext Access® and Euronext Growth® remain Multilateral Trading Systems. Listing Sponsors continue to advise companies listed on Euronext GROWTH and Euronext ACCESS + at all stages of their market experience. Listing Sponsors are responsible for advising and assisting the listed company in its interactions with the market, in particular through investor meetings. Each Listing Sponsor shall do its utmost to advise and accompany each Issuer for which it acts as Listing Sponsor by organizing one investor meeting per year at the minimum. 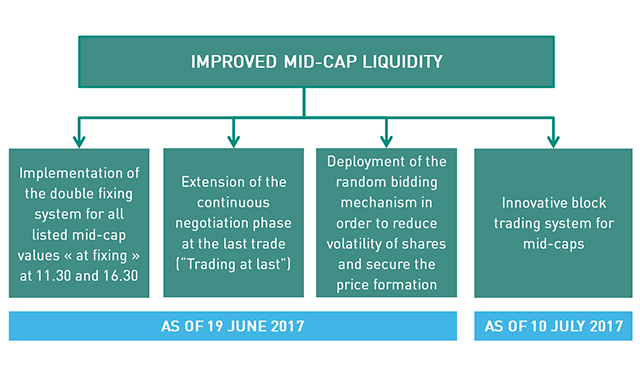 To improve the liquidity of mid-size stocks, Euronext is rolling out new measures to reshape and improve its market model on SMEs. The aim is to increase the liquidity on these securities by offering an efficient and adapted trading model. and from the “Trading at Last” allowing investors to operate with a unique price in a particular time frame (from 11:30 to 15:00 and from 16:30 to 17:30). This represents a “hybrid” model between continuously traded instruments and fixing only. * the launch of Euronext Block is subject to the approval of regulators. Are you looking to raise funds, grow your business, expand externally, structure your capital, hire and retain talent or even grow your international presence? The answer lies with Euronext’s simplified offer, which is accessible to any type of business, from SMEs to large groups. 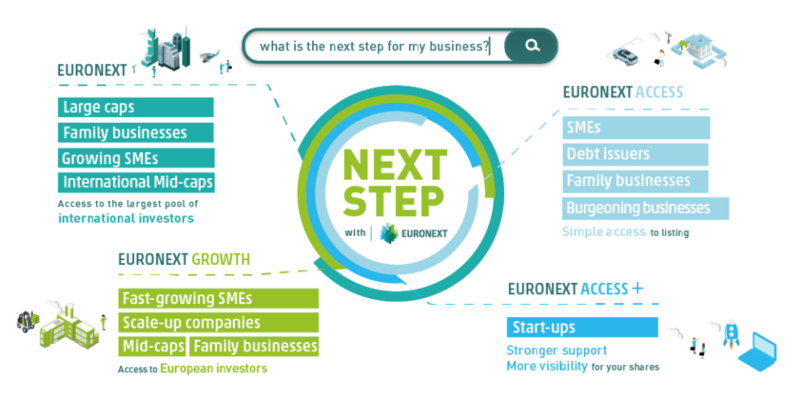 Euronext is right by your side to support funding for your “next step”, thanks to new and improved markets for Small & Mid Caps, to provide even better support as you grow. Euronext offers advice and expert services which enable your stock market activity to follow your ambitions for you in an ever-changing world. Euronext is more than a source of funding, it is a long-term support and the partner for success. Euronext’s team of listing specialists is happy to answer any questions your company has regarding listing on one or more of our European cash markets.